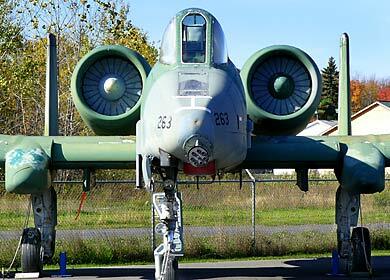 You can visit the Empire State Aerosciences Museum at the Schenectady Airport, NY. For directions and hours see the ESAM's website here. 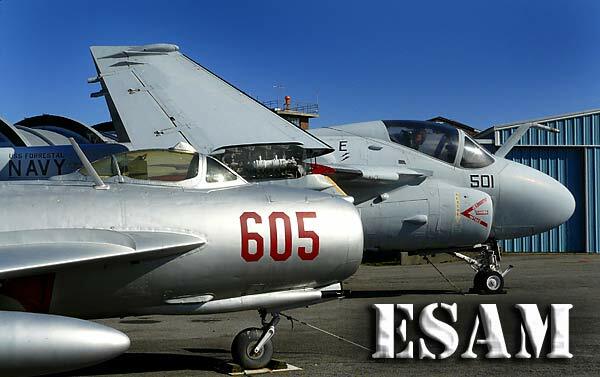 The ESAM was more interesting than I had expected after going the photos of exhibit aircraft on the museum's website. 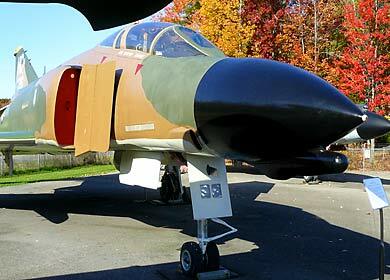 Their F-4 Phantom is done up very well in Vietnam Era camouflage and the MiG-17 and MiG-21 are very slick looking also. 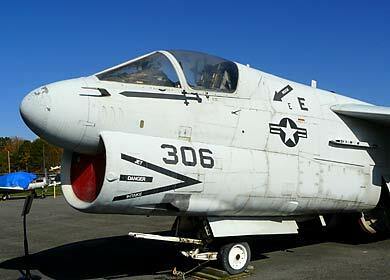 The Grumman A-6 Intruder has been restored to a very high standard as was the gleaming black Northrop F-5E Tiger. I wondered why the F-5 was roped off until I read the airplane's spec placard. This particular jet was used by the Navy's Aggressor Squadron 13 at Naval Air Station Fallon, NV. 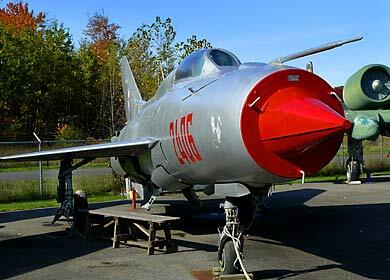 This aircraft also appeared in the Tom Cruise movie "Top Gun" as a Soviet jet fighter. The A-10 Thunderbolt II looks good and I liked the clever way they covered over the turbofan engine intakes with disks that had fan blades painted on them. Although you can't see it because of the bird covers, the museum states that the F-14 Tomcat still has its engines. That's unusual as most museum F-14s had their engines removed by the US Navy to ensure they don't find their way back to Iran who desperately needs parts to keep their F-14 fleet airworthy. The RA-5C Vigilante is also very well restored and is a rare airplane to be found in a museum. ESAM volunteers were busy working on the T-2 Buckeye and I had to wait until they took a lunch break to get the shots I wanted. There is also an M42 Duster light tank on the grounds. The Duster is in the process of being restored and the areas of the tank that have been cleaned and painted have been done very well. Inside the EASM museum are a number of aviation exhibits and aircraft. The DePischoff Flying Motorcycle replica is pretty amusing, and there is a pretty interesting representation of an Antarctica Base Station. A real gem is the Lockheed 10 Electra fuselage which was used in the Amelia Earhart movie, "Final Flight". The interior is a detailed recreation of the Lockheed Electra Earhart flew on her last flight where she disappeared over the Pacific Ocean, complete with navigation desk and additional fuel tanks. It gives you an idea of how separated Earhart was from her navigator Fred Noonan. They communicated by passing notes back and forth from the cockpit to the rear cabin via a bucket on a clothesline. But the biggest surprise was not even listed in EASM's website at the time I visited the museum in fall of 2008. Set aside in its own room in the second display building is the actual model of the Japanese aircraft carrier Akagi that was used in the filming of the movie "Tora Tora Tora", depicting the December 7, 1941 attack on the US Naval base at Pearl Harbor, Hawaii. This is no desktop model. The Japanese carrier is 32 FEET long and depending on which staff member I spoke to powered by a 2 cylinder diesel engine or a golf cart motor. The flight deck hinges up so a pilot can sit inside and drive it. There is no way for the pilot to look out so they either used radio commands or a really loud bull horn. The last few minutes of the film feature this particular model. It is one of three Akagi models, the other 2 being destroyed during filming for some reason. This Akagi model was built in Japan to scale from original Akagi blueprints. The attention to detail is very impressive, right down to the little binoculars mounted on the bridge. The modelers put a lot of care and effort into its construction, and considering it (or the 3 together?) cost $1,000,000 US, which in 1969 was a great deal of money. I have to admit the Akagi was my favorite exhibit at the museum. You walk into the room and can't help but say "WOW!". There is one discrepancy from the original though. The bridge island is on the wrong side of the ship. This was done deliberately as the model needed to mirror the flight deck layout of the USS Yorktown which was used for the filming of the launching of the full sized aircraft from the flight deck. There is no food other than vending machines on site at the Empire State Aerosciences Museum, but there were fast food chains between the highway and the museum. There is a break room if you bring your own lunch. Keep an eye on their website. I went on a day they were doing a pancake fundraiser breakfast. Everything was really good and they do host them throughout the year. All of the indoor exhibits were on one level, aside from the raised viewing platform in the Akagi room, so the museum is fairly handicap accessible. All of the outdoor exhibits were on one level of asphalt, and are easy to view if you are up for a little walking. The Empire State Aerosciences Museum is located on the grounds of the Schenectady County Airport in Glenville, NY and was an easy Google maps drive from the NY State Throughway. Pay them a visit. The staff were quite friendly and eager to tell you about exhibits and planned upcoming improvements to the museum. "An update: We are also the beneficiaries of a man's interest in WW I. Due to failing health, he donated his initial work on a 7/8 scale Nieuport. As we progress with restoration and completion of this aircraft, we will decide on the model number. We've made an addition to the Akagi room which really enhances the display of the model. We've installed a backdrop of a sea-scape. This "puts" the carrier in a setting more fitting than the blue wall that was behind it at the time of your visit."